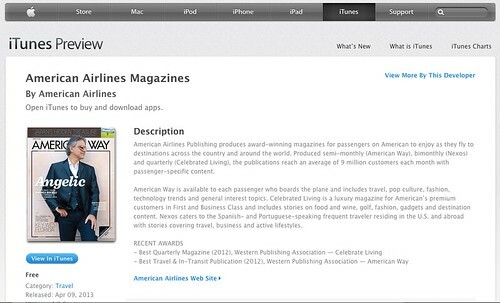 American Airlines Publishing just published the very first iPad edition of their American Way inflight magazine. It’s the same familiar magazine you find in the seat back pocket on every American Airlines flight, it’s free, and it’s compatible with iPad running iOS 5.1 or later. Go here for more info or download directly from iTunes on your iPad.